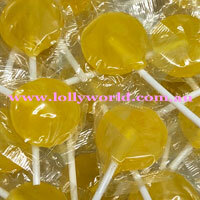 Lollipop Yellow with its pineapple flavour is great for parties and lolly buffets or colour coordinate your next function. Use as a hand out for your promotions, these economical lollipops make budgeting easy. Each round lollipop is 3cm in diameter and roughly 8g.